This year I attended Syncrofest 5 held at Hollister Hills State Vehicular Recreation Area located in Hollister, CA. I first attended this event last year (my photos HERE) not in my van but in a rental Westfalia I picked up in Redwood City, CA. 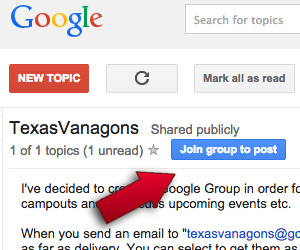 This event had 174 Vanagons turn out last year and a whopping 213 Vanagons this year. It’s an amazing event! 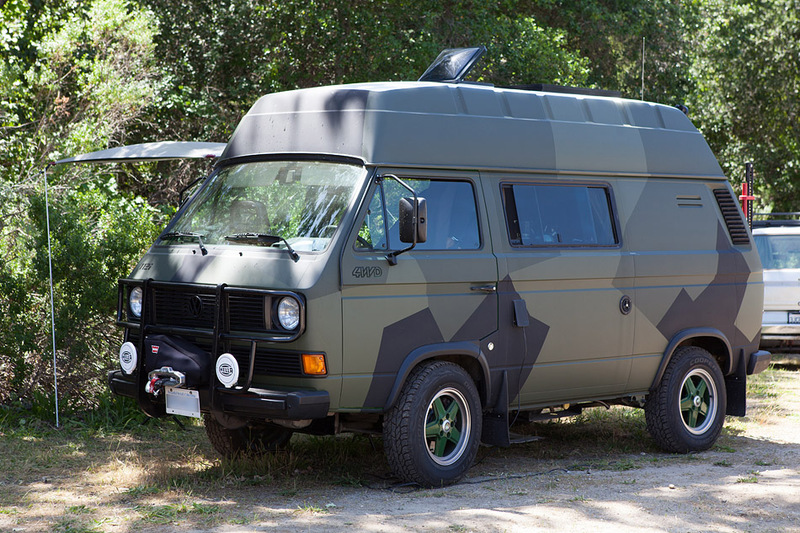 I wanted to highlight a particular Vanagon that out of the 213 total vans it won the Best Syncro Award. Once I saw this van pull into the venue I knew I had to stop by and check out. This hightop is one I had never seen before, not this specific van but the style of hightop itself. As it turns out this is a genuine VW high top addition straight from the VW factory in Hanover Germany. Yes there were other high tops fitted to vans but they were done so by third party outfitters such as Westfalia and Adventurewagen etc. 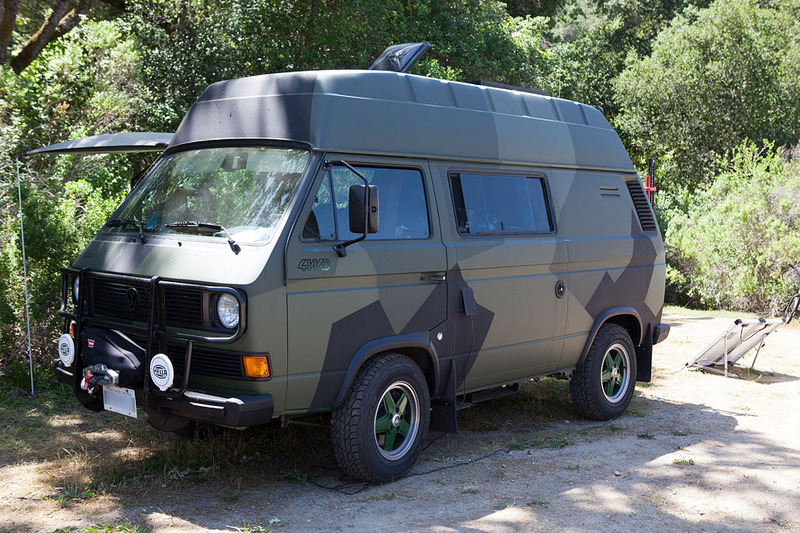 This particular high top is referenced as the Postalroof as they served as postal vans in Germany and is the only modified roof option that VW had their hands on directly. I stopped by to take a few photos and ask a few questions and I ended up interrupting their lunch that they were in the process of making. I didn’t stay long, just asked a few questions and ran along to let them dine in peace. lol. 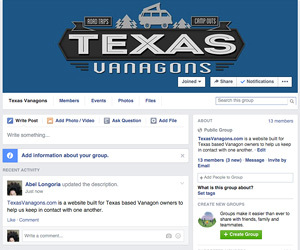 With that in mind I will forward what info I do know and what info I’ve learned from various members of the Vanagon Owners Group on Facebook. Hell.. I don’t even recall the owner’s name at this point so I’ll just call him John from here on out. John and his lovely wife Jane (yup I don’t recall her name either) drove down about 1,000 miles from British Columbia to make this event and man am I glad they did. This Vanagon was a treat to see in person. It was imported over from Germany and found its way into the hands of this lucky couple. As soon as I saw it roll in I knew this Vanagon was the one to beat for Best Syncro. The van’s interior was completely redone and is one of the best I have seen. 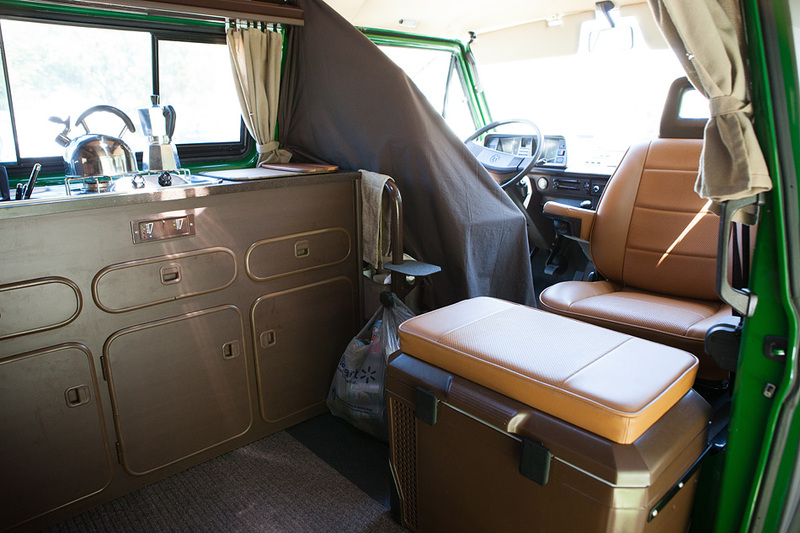 Anyone that knows me can tell that you I have some sort of weird Westfalia interior fetish or something because I love seeing what people have done to they stock interiors. This interior is a perfect blend of stock and custom cabinetry. 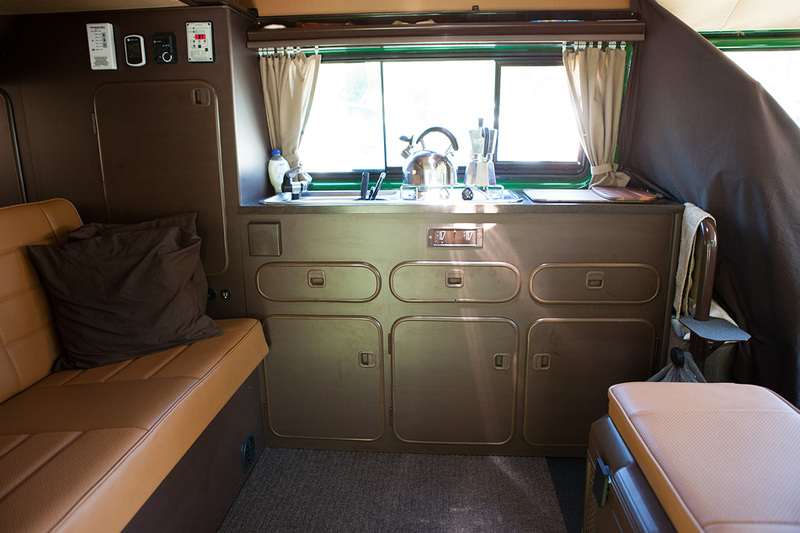 The van interior started out as whats seems to be a mix of a tan/brown Westfalia Weekender and Camper interiors. John resurfaced all of the paneling, drawers and doors in order to ditch the bland looking tan laminate. I spy with my little cabinet fetish eye… a Weekender rear closet, with a custom built middle closet that’s home to a early Vanagon refrigerator door for more access. In front of the middle cabinet is a custom galley area utilizing 3 resurfaced Westfalia camper drawers as well as the associated medium sized cabinet doors that reside below them in stock Westfalia Campers. All flat surfaces have been resurfaced and the original Westfalia brown trim, latches and hinges have been reused. Nicely done! Galley wise it looks like John is using a SMEV Sink/Dual Burner Stove combo coupled with a nice Silver/Black Shurflo Tracker Marine Faucet. This color combo sure beats the cheesy white Shurflo I have installed. lol. This sink/stove combo looks to be installed on some sort of Corian or Silestone hard countertop. So much nicer than a flat matte laminate surface I have in my house much less in my van! ha. 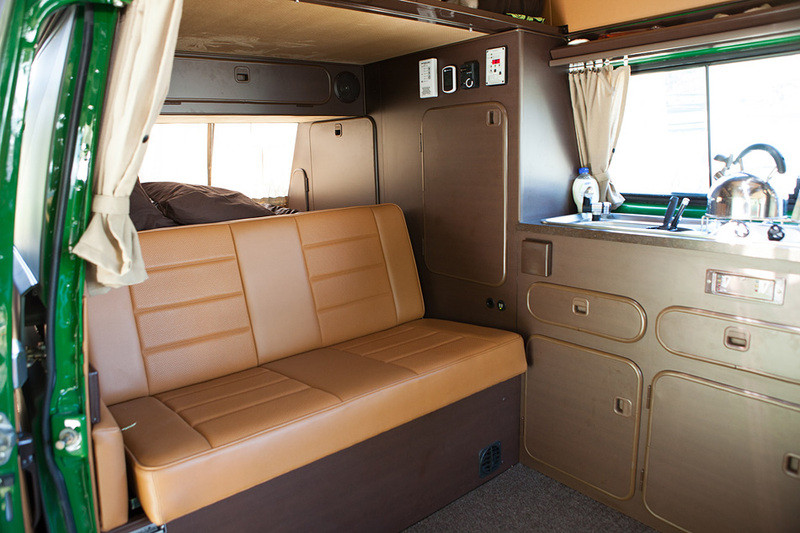 A Propex propane heater is mounted under the Westfalia Camper fold down bench seat with a roof top Fantastic Fan/Vent controller, wireless refrigerator thermometer, the Propex heater thermostat and solar panel controller mounted on the closet wall for easy access. A 12v socket and dual USB charging port is just below the main closet door, another good location. Oh and the leather upholstery. Wow. This is by far one of the best upholstery jobs I’ve seen on a van and this shade and choice of material is SPOT ON! 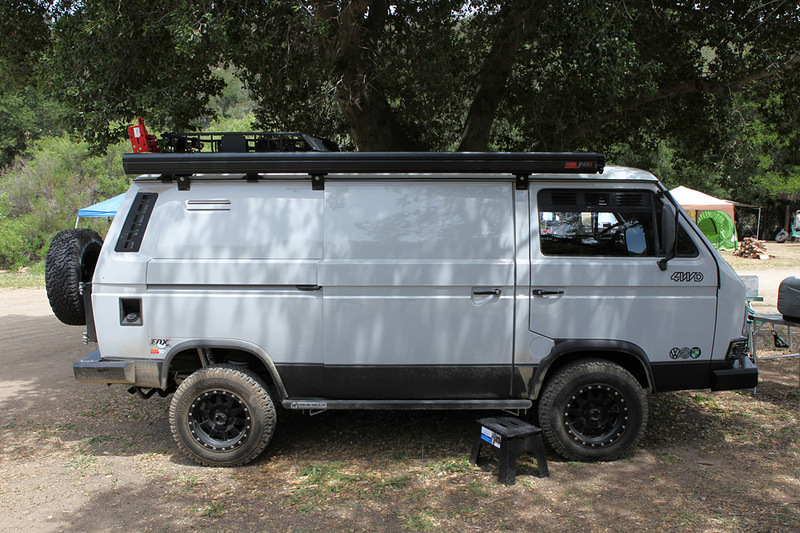 I love the fact that John chose to stay with stock Vanagon front seats (as opposed to Eurovan or Recaro seats) and have those redone in order to stay true to the van’s roots. The matching padded foot rest on top of the color matched Engel MR40F 12v Refrigerator is a nice touch. Makes the fridge serve two purposes. I also like the custom black bracket that John added to the sides of the fridge so that it can be securely fastened to the Van’s passenger seat pedestal. This is way cooler than my current fridge tie down system and it has inspired me to revisit and see about improving my method. A quick walk around the backside of the van I noticed some nice rear facing LED flood lights for illuminating your path while backing into various camp sites. 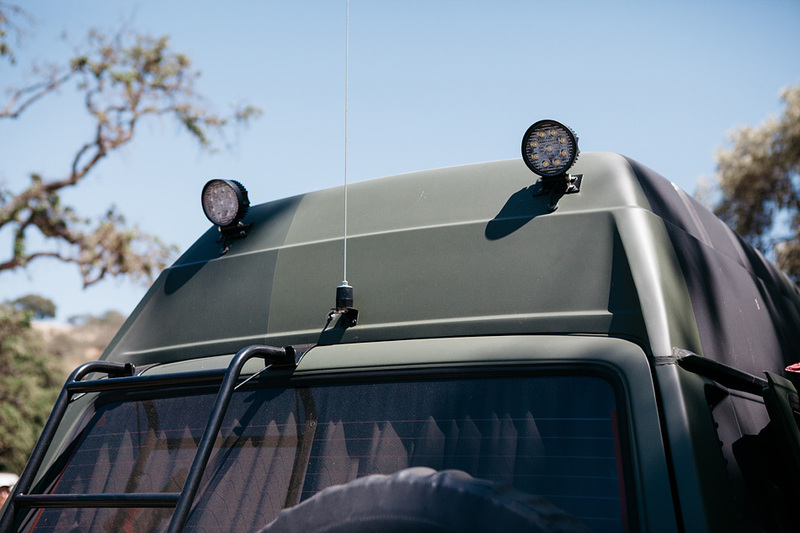 The LED mounts are very low profile and minimal, the wiring ran nice and clean into the van through the fiberglass top. “Clean” is a term I find myself using a lot when looking at this van. Not clean as is not dirty but clean as in a nice clean install. Top notch. The exterior was painted in a 3 shade camo scheme which is used on Finnish military vehicles. At first I thought it may have been a Plastidip project but nope. It’s a legitimate full fledge paint job. I’d love to see Libby adorn a similar paint scheme but with winter camo in mind, black, grey and white. That’d look sweet. Yea winter camo scheme in Texas… Sureeeeee… That’ll fly. You’ll notice the color of his Mercedes Benz Ronal R9 wheels. They don’t quite match the current paint scheme at all but if you notice the door jams in the previous photos you’ll see that these wheels had been color matched to the previous paint scheme. I hope updating the wheel color to match the camo paint scheme is on the list of to-do items. Seeing how meticulous John and Jane have been with this van I can pretty much guarantee its in the works. John and Jane… Congratulations on winning Best Syncro at Syncrofest 5 this year. It is very well deserved. I hope to see you at Syncrofest 6! An for the record I’m 2 for 2 in picking Best Syncros at this event… Last year at Syncrofest 4, Khoa Pham from Huntington Beach won the Best Syncro Award with this double door panel van imported from overseas. Wait a minute… I’m starting to see a pattern… rare Syncros sourced from overseas tend to go home with the shiny hardware! Ha! UPDATE: I got an email from John errr I mean Barry the owner! Thanks for the awesome article on my Syncro ! One of my customers tipped me off to your blog and I thought it was super well written and great photos too. That van was originally delivered to the Finnish Army, and the camo scheme is what they used. It is a real Syncro 16 and they used it as an Army Ambulance. I imported it with the help of Busman back in 2013. Glad you liked it! Oh and the Ronals are staying Escorial Green, Very Happy Weird I know ! Just like that van – its a strange one. Looking at the Grey Syncro (last pic). Any idea on the wheel and tire specs on this. Looks like the ET is pretty small and I’m looking for a similar set-up for my 87 Syncro.